PT Pertamina (Persero) - Pertamina is Indonesia’s national Petroleum company wholly-owned by the Indonesian Government. Headquartered in Jakarta, Pertamina has main responsible to managing energy resources in Indonesia. Pertamina running business in managing integrated oil and natural gas industry, from upstream to downstream activities. Its business include oil and natural gas, renewable and new energy resources. As of the end of December 2016, PT Pertamina (Persero) runs its business through 27 wholly owned subsidiaries, 7 associated companies, and 6 joint venture companies. Pertamina has 6 refinery units and 8 Marketing operation regions spread in all over Indonesia. Pertamina booked positive growth in 2016. Pertamina registered total crude oil production of 311.56 MBOPD in 2016. This total crude oil production number is up 11.9% from 278.37 MBOPD in 2015. 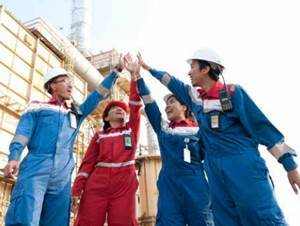 Pertamina booked total net profit of US$3.15 billion in 2016 or up 121.6% as compared with US$1.42 billion in 2015, according to PT Pertamina (Persero) Annual Report 2016 as cited by JobsCDC.com. Referring to its annual report, Total assets in 2016 grew by 4% to US$47.23 billion from US$45.52 billion in 2015. S1 Accounting, Management, Taxation, Business Management. Required experience for minimum 13 years in the field of Taxation. Possess certification in Tax Brevet A, B, C or have formal Certificate of Taxation Education. Previous experience in Finance, preferably in Tax Management Accounting. Have a good knowledge of Tax Accounting / PSAK / IFRS related as well as Analysis of Taxation Implications in Business Scheme and Financial Statement. Mastering all types of Taxes, Income Tax, VAT, Income Tax Cut, International Tax, Regional Tax. Have an understanding and experience of at least 8 years in evaluating upstream business. Able to evaluate the Proposed Budget Pre Project Investment Business Development. Previous experience in Business Management, preferably in Business Planning / Business Development. S1 Business Management with 12-15 years of experience. S2 with 9-12 years of experience. Able to coordinate, monitor, evaluate and manage the Company's Financial Capacity related to Upstream Business Investment. Able to coordinate, monitor and evaluate for Business Portfolio Formulation and Integration, Optimalization Calculation and Recommendation Follow-up Business Portfolio Optimization. Able to develop Business Development Strategy and Criteria / Parameters in measuring business development. Able to analyze the cooperation, qualification of partners and the feasibility / risk of cooperation programs. identifying the information needs of regulators and stakeholders. S1 Finance and have experience for at least 10 years in the field of finance. Able to understand and analyze the basic principles of Finance related to working Capital Management (Treasury), Capital Budgeting, Cost of Capital, Leverage, Financial Statement analysis, Long Term & Capital Structure, Deviance & Share Purchase, Financial Planning, Insurance Management and Inventory Management. Possess certification in CFA Level I. Have a good understanding about the guidelines related to finance, PSAK / IAS and IFRS. Have experience for at least 10-12 years in the related field. Previous experience in Accounting and Corporate Strategic, ERP Analyst, Business Process and Auditing. Possess Chartered Accountant (CA), Certified Public Accountant (CPA), Brevet A & B Training, Chartered Financial Analyst (CFA) Training. Able to direct, Monitor and Evaluate the Study and Support activities in publishing, revising and implementing the Working System System (STK). Have experience for at least 8 years in the relate field. Have a good understanding and experience in Evaluating Upstream business. Able to Validate and Coordinate the Formulation of Recommendations on the proposed cooperation and development of Upstream Business (Investment). Able to identify the Potential Business Development. S1 Business, Management and have experience for at least 9 years in the related field or S2 with experience for at least 6 years. Previous experience in Business Management, especially Business Planning. Able to develop Contract Management Company and Cascading KPI, Memehami Service Level Agreement. Able to provide input and recommendation of Company strategy based on Performance Achievement analysis. JobsCDC.com now available on android device. Download now on Google Play here. Please be aware of recruitment fraud. The entire stage of this selection process is free of charge. PT Pertamina (Persero) - Experience Hire Program Finance Directorate Pertamina October 2017 will never ask for fees or upfront payments for any purposes during the recruitment process such as transportation and accommodation.